Stadium Advisory Group Introduced; Will its Advice Turn into Real Action? Another approach to getting a new stadium built in San Diego has just been put in motion. It’s an advisory group introduced Friday by Mayor Kevin Faulconer to come up with a game plan by this fall for crafting into a 2016 citywide ballot measure. The Citizens’ Stadium Advisory Group is made up of civic leaders and financial experts. The plan will include the optimal location and the best way to pay for the stadium. Smart money says the nine members – specifically not branded a “task force,” as previous such efforts went nowhere -- will do everything possible to avoid a tax-based financial scheme that'll require two-thirds voter approval under state law. San Diego Mayor Kevin Faulconer unveiled the members of the task force that will be charged with creating plans for a new Chargers stadium. NBC 7's Elena Gomez reports live from the press conference. The mayor said the city has had plans before, but never anything tangible until this effort. Their real hope, according to group members and officials involved in their appointment, is to find ways to private money so as to face only a simple-majority hurdle to passage. "The history of these things from San Francisco to Portland, Maine is that two-thirds is virtually impossible,” said Los Angeles Times bureau chief Tony Perry, following a mid-morning news conference east of Petco Park in downtown’s East Village. “And of course we're in San Diego -- Libertarianville here -- and we don't like taxes for anything. So that, I think, is pretty much a non-starter." Said Associated Press sports correspondent Bernie Wilson: ”It seems like a creative group; it seems more business-oriented than politically oriented, which some of the former task forces have been." One key member member is Jim Steeg, who produced 26 Super Bowls for the National Football League and later served as a Chargers executive. Another is Adam Day, assistant manager of the Sycuan game tribe and board member of the state university system -- two potential players in the financing effort. They'll be looking not only at downtown's 12-acre East Village site – but revisiting the 166-acre Qualcomm Stadium site in Mission Valley, the NFL’s second-oldest venue. But the greater challenge is sifting through possibilities for bankrolling the billion-dollar price tag of a new stadium, including taxes if they prove unavoidable. Those options include funding from the league and Chargers, stadium naming rights, corporate partnerships, seat licenses and surcharges on tickets, parking and concessions. The team also has spoken of exploring the prospect of financially "leveraging" city land such as the 105 acres that encompass the Valley View Casino Center and city-leased retail and real estate properties in the Sports Arena/Midway District. "There are a lot of different ways to skin the cat,” Steeg said in an interview. “It will involve maybe cobbling together five or six of those concepts to make one. And I think that's the greatest thing -- to have an open mind and try to find one." A major obstacle in the process is the city’s quest for larger convention facilities. Hotel owners want the bayfront center expanded on-site. The Bolts want a hybrid facility, linked to a retractable-roof stadium across Harbor Drive. A statement issued by Chargers special counsel Mark Fabiani indicates the franchise is under-whelmed by the new advisory group, and that it will be “pleased to evaluate any other ideas” beyond the nine stadium proposals it’s advanced over 13 years. But Steeg sees a path to the promised land, and he has a sense that the time is right: "I think you finally have the political will to get it done. And to me that's been the problem all along. Obviously in the last ten years, how many mayors have we had? Eight? Something like that? So we've never had that. We've had all sorts of issues going back and forth." Either way, with speculation raging around a proposed Inglewood stadium on land held by St. Louis Rams owner Stan Kroenke and Hollywood Park interests, San Diego might wind up on the clock with the NFL, if it’s not already. As NFL commissioner Roger Goodell told journalists at his pre-Super Bowl news conference in Glendale, Arizona Friday: "They do need a new stadium for the Chargers to be successful long-term. 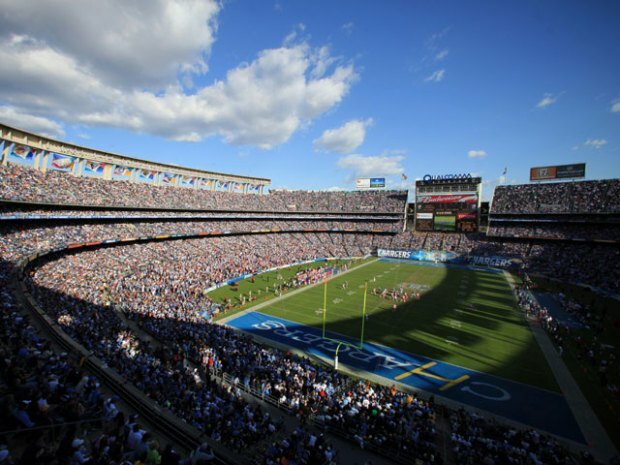 It's one of the oldest if not THE oldest stadium in the league … I'm glad to hear (Faulconer has) a task force going. But they've been working at this for 12 years, and it's something we need to show tangible results sooner rather than later." In the wake of Faulconer’s news conference, onlooker Jan Bourgeois, an East Village resident and Padres mini-season ticketholder, was asked what she makes of what she had heard. "I agree with most of them that you will not get the 66 and two-thirds, so you need to figure out another way to bring everybody to the table to be able to move it forward,” she told NBC 7. “Because I love the Chargers. I don't go to the games but I always watch them on TV -- all the preliminaries and follow-ups afterwards." An NBC 7 report in January said the Chargers were less-than-impressed with the mayor’s initial proposal at his State of the City address. It seems everyone has an opinion about the future of Qualcomm Stadium. Even NBC football analyst Cris Collingsworth gave NBC 7 SportsWrap his two cents. Anyone wishing to provide input for the project can email the mayor at StadiumInput@sandiego.gov.